EghtesadOnline: Tehran has never stopped standing against Washington's threatening moves but has shown reciprocal and sharp reactions toward them, said Iranian first vice-president on Saturday. 'The United States is trying to show that Iran is a risky and unstable country for business and business people and governments should not work with Iran,' Eshaq Jahangiri noted at a local meeting with the officials of private sectors. 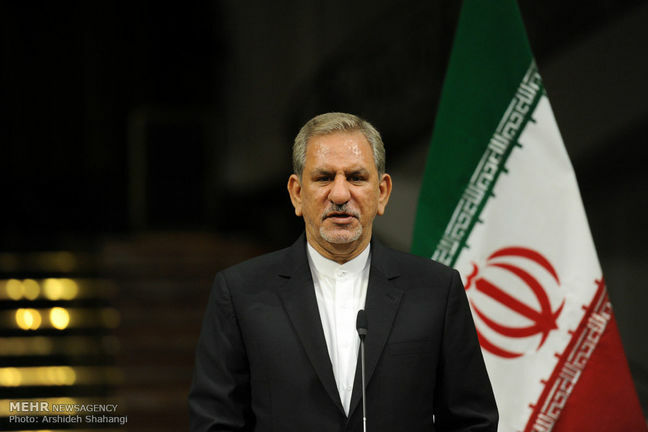 "We have interacted with the world in such a way that the US measures cannot threaten Iran's position in the international community scene," IRNA quoted Jahangiri as saying. Referring to the complicated conditions in both the world and region, Jahangiri said the extremist groups have created tensions in the region with the help of certain regional countries and also the Zionist lobby against Iran which has been active since the outset of the establishment of the Islamic Republic in the country is getting more active and has been able to influence some regional countries and has pooled with certain Islamic countries to impose pressures against Iran. 'The new US administration is a new trend planning new moves with tougher approaches against Iran,' the first vice-president added. The US officials follow certin goals, and their major aim is to persuade the international community in vain that Iran is a violator of the July 2015 nuclear deal known as the Joint Comprehensive Plan of Action (JCPOA), said Jahangiri. He added according to reports and also based on the anti-Iran measures taken by the US to impose new sanctions against the country, Washington is the one violating the JCPOA not Iran. In Iran, a commission has been established to monitor the implementation of the international deal, Jahangiri said, stressing that the country will react to any move taken by any party to the JCPOA against the agreement.